You’re getting the itch to go camping in the Eastern Sierra, but unless you’re the hardy winter camping sort it’s a little too early to head up into the high country. Perhaps you bought some new gear recently or you need to dust off the old stuff and get things prepped for the summer. Then spring in Bishop is a wonderful time to get back into the camping groove. 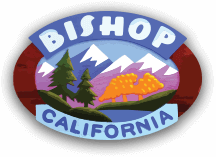 Pack up your RV, toss your tent in your car, or just swing your backpack over your shoulders and head to Bishop. 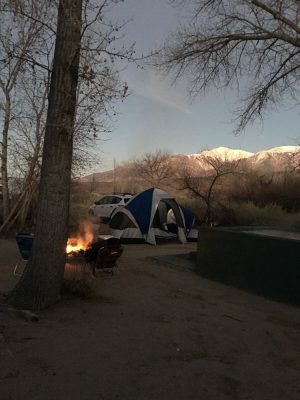 There are numerous campgrounds and campsites in, around and near Bishop that offer the gamut from full hookups to boondocking. What’s more … where full service is offered the sites are spacious and within walking distance of public lands where fishing, hiking, cycling and more can be enjoyed by the whole family. Primitive campsites offer contemplative solitude and some are little more than a 20 minute drive from town. Just about any style of camping you could want is right here in the heart of the Eastern Sierra. This is a fun resort-style campground located one mile south of Bishop on Highway 395. Stroll the old west replica Main Street displaying antiques from old Bishop. The campsites are large and grassy and the views are just spectacular. The country store and café serves hot and cold sandwiches, old-fashioned ice cream, homemade pies, fine candies, souvenirs, camping supplies and fishing tackle. Of course where there’s fishing tackle there’s fishing. The Owens River is just a couple of miles to the east and a short drive north will get you to Pleasant Valley Reservoir. Just a short walk next door gets you to Bishop Country Club where you can enjoy 18 holes of golf or a meal on the restaurant patio. Six miles north of Bishop on Sawmill Road is the Millpond Campground. Situated in the Millpond County Park camping here still provides all the amenities, but gets you just that much further out there. Hiking and mountain biking trails run right by the campground and will take you out across the sagebrush or up into the Tungsten Hills. In spring the snowcapped peaks of the Sierra Nevada shine brightly on a moonlit night and the gentle burble of a nearby creek fills the quiet night with a liquid melody. There are tennis courts, a ball field, a playground and fishing pond. This is the perfect place for a family to unwind and let loose. This isn’t everything you would want when camping. It’s the only thing … your very own private natural spring-fed hot tub! Ok, perhaps you want your tent and a campfire and good bottle of something while you soak away all your stresses. This beautiful and tranquil campground is located in the historic town of Benton, one of the oldest existing towns in Mono County, just 38 miles north of Bishop on Highway 6. Explore the old mining town, go for a hike or mountain bike ride in the surrounding hills, or ride a road bike on these roads that you’ll have almost all to yourself. It’s simply sublime. About a dozen campgrounds are run under the auspices of Inyo County of which one is this gorgeous gem just 6 miles northwest of Bishop. On a quiet stretch of road along the Owens River adjacent to Pleasant Valley Reservoir this campground provides vault toilets, tables, grills and fire rings. It’s open year round on a first-come-first-served basis and the automated pay stations accept credit cards. Naturally fishing is prime here and there are any number of tracks and trails to hike or bike. World-class bouldering is just a few miles east along Chalk Bluff road where the numerous canyons and washes cut down from the Sherwin Plateau. An extensive network of over 2,200 miles of OHV trails and roads leading through almost one million acres of the Inyo National Forest can be accessed from here. 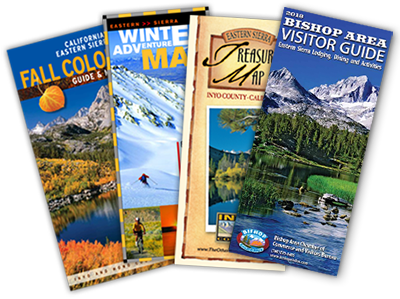 Excellent maps have been produced by the California Trail Users Coalition and are available free of charge at many of the trailheads and, of course, the Bishop Visitor Center. 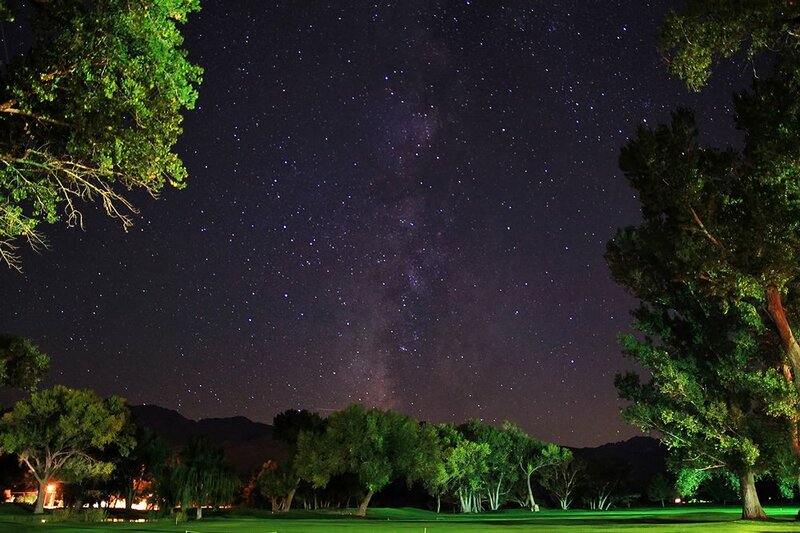 With the towering peaks of the Sierra Nevada as a backdrop by day and an impressive canopy of stars and the shining Milky Way by night this campground really gives the feeling of being way out there. The nearby Tungsten Hills are great place for hiking and exploration. It’s a favorite place for rock hounding and crystals of red garnet can still be found here. Birdsong heralds the start of spring as large populations of breeding songbirds nest along the willow-lined stream. Spring brings the desert peach into bloom with its pink blossoms and jasmine-like scent and the bitterbrush presents its yellow color and spicy perfume giving soft color and sweet fragrance to this arid landscape. Herds of mule deer, which have wintered in the foothills to feed on the tender shoots of the bitterbrush and sagebrush, may wander nearby as they make their way back up to the higher elevations. Horton Creek campground is open from May 1 to October 30 on a first-come-first-served basis. Amenities include vault toilets, campfire rings, tables, and lantern holders and a campground host is onsite to help with any needs or questions. Spring is always unpredictable in the Eastern Sierra and the higher you go the more you may be subjected to rapidly changing conditions. At the end of April when the Big Trees Campground opens there may still be some snow on the ground and it could still be a little chilly overnight. Named for the very large Jeffery pines that grow here this campground gets you up into the alpine zone and into bear habitat. Managed by the USFS this campground provides clean drinking water, a flush toilet and a vault toilet, and bear proof storage lockers. 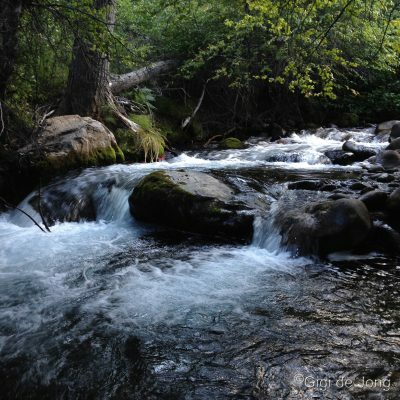 Situated along the banks of Bishop Creek – wilderness is just a few miles away. Spring could deliver the opportunity for cross country skiing, snowshoeing or a good strenuous hike for the intrepid adventurer. It might, however, just bring a soft rain shower and gentle breeze for a lazy weekend and reprieve from the heat of the valley. Under the auspices of the US Forest Service much of this land, between highway 168 and Horton Creek, is allocated for ‘dispersed recreation’ year round. Although interspersed with private and non-public utility lands, the Buttermilks basin is a huge tract allowing for a great variety of recreational activities with camping allowed on the public lands. Numerous dirt tracks and single-track trails connect for miles of exciting mountain biking and dirt biking in and around the Tungsten Hills. 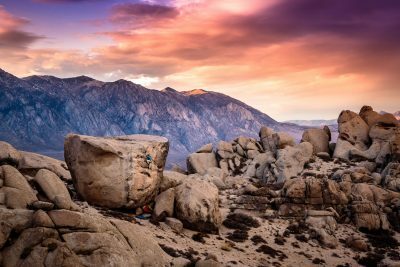 Massive boulders provide some of the most accessible and diverse bouldering in the country with routes that offer everything from fun scrambling to highly technical ‘problems’ that challenge even the world’s best climbers. Summer days are hot and winter nights are cold. Spring and fall are unsurpassed. Mountain peaks tower above the desert floor and a canopy of bright stars sparkles in the night sky like a never-ending display of brilliant fireworks. Follow Highway 186 West from Bishop for 8 miles and turn right onto Buttermilk road. Venture into a land that will let you stretch your eyes, restore your soul, and ease your mind of the pressures of everyday life. If seclusion is what you’re looking for Pine Creek canyon is where you’ll find it. Primitive campsites are hidden from view under large willows and tall conifers alongside the creek. Spring can be chilly in this deep canyon, but as the season turns to summer there is respite from the desert heat here. This is a gateway to the John Muir Wilderness where access to high country trails is at the head of the canyon. Permits are required for overnight trips into the wilderness, but here in the canyon dispersed camping is quiet and private. Known by climbers as Benton Crags this area covers a large tract of National Forest where county roads and forest trails lead to numerous dispersed campsites. An area on either side of Benton Crossing road – Banner Ridge to the east and Wildrose Canyon to the west – is a wonderful mix of sub-alpine terrain with stunning rock formations, natural springs and seasonal creeks. Spring is very changeable up at this higher elevation and temperatures can change suddenly as weather patterns move swiftly across this mountainous terrain. Depending on the specific campsite chosen you may have views of both the Sierra Nevada to the west and White Mountains to the east and the surrounding rugged hills. From here you can venture out on foot, by bicycle – road and mountain, dirt bike, or in a 4×4 vehicle. Rock scrambling for uninitiated climbers will thrill and trad climbing can challenge the more experienced. It feels like a world away, but it’s only a few minutes drive to the little town of Benton for basic resupply or about 35 minutes to Mammoth Lakes and 55 minutes to Bishop. High up in the Inyo Mountains, about a 1-½ hour drive south from Bishop (requiring a high clearance 4×4 vehicle for the final ascent), is a landscape that looks otherworldly. Tall rock pinnacles stand as sentries on an expansive mountain flat bordered by high ridges and lofty peaks. Campsites are dotted along the ridge overlooking the Owens Valley and higher up among the junipers on rocky outcrops looking out over the flat. Looking west the soaring Sierra Nevada appears equal to this range from this lofty perch. Storms build and roll in quickly and it’s advisable to keep an eye out for clouds building in the early part of the day. Long clear, cool days are frequent and filled with the quiet sounds of the whispering wind and birdcalls. Sunrise and sunset are dazzling times of day as colors range from blue to yellow to pinks, oranges, and reds. Bring plenty of water and pack your hiking shoes, mountain bike, binoculars and camera. Before you venture out onto public lands be aware of the rules and regulations. Follow this link for more information about dispersed camping in the Inyo National Forest. The US Forest Service provides an interactive online map that is excellent for road and trail identification with details describing: route designation, length, surface type, status, jurisdiction, and accessibility. It is a wonderful resource for planning a camping, hiking, cycling, or off-road driving trip. You may also want to download two scalable jpg maps here that cover much of the Eastern Sierra from Coso Junction to Conway Summit. Stop in at the Bishop Visitor Center at 690 N. Main Street for maps and information.